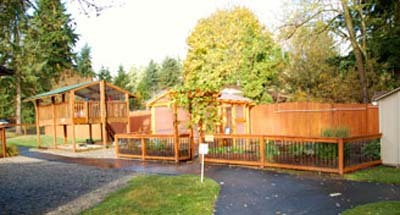 With the help of an outdoor designer and an outdoor classroom committee, Woodinville Family Preschool has developed an amazing outdoor classroom which was carefully planned to maximize space, traffic flow and natural beauty. A local craftsman designed and built the decks, storage and greenhouse with support and input from parents and staff. Under the supervision of the outdoor designer, volunteers helped to create a playhouse, sand area, slide hill, tunnel and swing area. Volunteers also designed and built garden boxes, which they plant and tend on a regular basis with the children. An extensive garden area creates many opportunities for learning. This green, growing area includes an apple and pear tree and a pumpkin bed, providing the classroom with seasonal as well as year-round fruits and vegetables. A custom designed greenhouse is also available to the children not only for gardening and science experiences, but also for creating art. Donated native wood and rot resistant cedar and Trek materials help in sustaining classroom components such as tables and chairs and blocks for imaginative play. Large rocks are included in the climbing area and with native plantings, gravel and grass, create lovely boundaries between areas. Also included in the master plan is a permanent water feature, toddler area and covered gathering area. Living in the Pacific Northwest, natural “water features” are often part of the daily experience. Children regularly use the downspouts as well as puddles for creative water play. 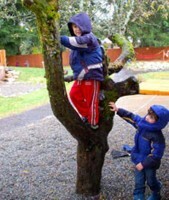 Generous donations of time, money, resources and materials from community partners, Woodinville Family Preschool membership, friends, parents, family members and alumni have made the new Nature Explore Classroom a reality.